Product #15848 | SKU DJM-900SRT | 0.0 (no ratings yet) Thanks for your rating! The Pioneer DJM-900SRT 4-Channel Serato DJ Mixer is designed for DJing in clubs, concerts, music studios, and live events. The mixer is especially useful for DJs who play Serato because it includes an internal 24-bit/96 kHz Serato-certified USB soundcard. Each input channel includes stereo RCA for both CD/Line as well as RCA phono inputs for turntables with ground. For outputs, the unit features both stereo balanced XLR and unbalanced RCA connections. The mixer's digital 32-bit Digital signal processing enables a variety of effects. The unit features Pioneer's Sound Color and Beat effects, and its X-Pad touch pad allows the DJ manipulate and apply effects in real-time. 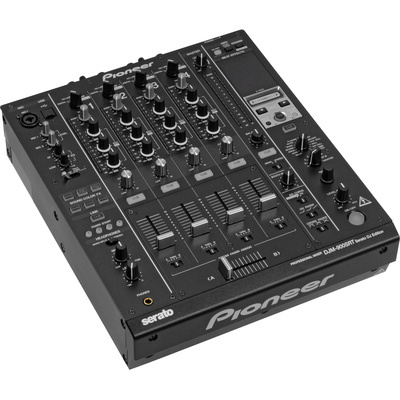 In addition to the inputs for turntables, CD players, line sources, and microphones the mixer also includes Pioneer's Pro DJ Link for connecting to compatible Pioneer CDJs. Additional features include S/PDIF digital connections, MIDI out, 1/4" FX send and return loops 3-band EQs/Isolators, and high performance durable channel faders designed to resist the effects of dust, moisture, and wear.